*Below is a conference summary prepared by Philippe Bracke (Bank of England). On May 4-5, the Bank of England hosted the conference Housing: Microdata, macro problems (program here) in London, organised by Philippe Bracke (Bank of England), Jonathan Halket (Cemmap and Essex) and Lars Neshiem (Cemmap, UCL, and IFS). The conference was co-sponsored by the Bank of England, CeMMAp and the Brevan Howard Centre for Financial Analysis; it also benefitted from a Transformative Research Grant by the UK Economic and Social Research Council. Alex Brazier, director of Financial Stability at the Bank of England, gave the opening remarks. His speech stressed the importance of academic research and, in particular, micro data analysis to inform policy decisions. Morris Davis (Rutgers Business School) started the academic presentations by talking about his research with Erwan Quintin (Wisconsin Business School) on Default when Current House Values are Uncertain. People’s evaluation of their own house lags aggregate price trends as measured by the Case-Shiller indices. The authors construct a model based on this empirical finding to replicate aggregate default numbers in the US. The discussant Colin Caines (University of British Columbia) highlighted the need for having more data on who defaulted in 2007-2009 and recommended the insertion of an unemployment shock in the model. Allen Head (Queen’s University) presented Default, Mortgage Standards and Housing Liquidity, a joint work with Hongfei Sun (Queen’s University), and Chenggang Zhou (University of Waterloo). Their quantitative model with directed housing search and mortgages, replicates the empirical association between debt level and asking price/time to sell, highlighted by the previous literature. Households’ decision to sell may be triggered by either a relocation shock or a financial-distress shock. In his discussion, Erwan Quintin suggested a greater emphasis on what search models one can add (persistence/propagation of shocks) on top of standard non-search setups. Aaron Hedlund (University of Missouri) presented Failure to Launch: Housing, Debt Overhang, and the Inflation Option During the Great Recession, where he sets up a general equilibrium model to evaluate the effects of an inflation increase (assuming policy makers are able to make this happen). The model predicts three effects: (1) inflation reduces the burden of debtors (standard Fisher effect); however, (2) the Fisher effect is offset by banks tightening credit to avoid a loss in profits; (3) the housing market becomes more liquid because of less indebted homeowners. The discussant Wei Cui (UCL) focused on the role of nominal rigidities in mortgage markets and the broader debate on the effects of monetary policy on housing markets. Kurt Mitman (Stockholm University) presented Consumption and House Prices in the Great Recession, joint with Greg Kaplan (Princeton) and Gianluca Violante (NYU). Their quantitative model allows for three kinds of shocks: credit conditions, productivity, and beliefs in future house price movements. 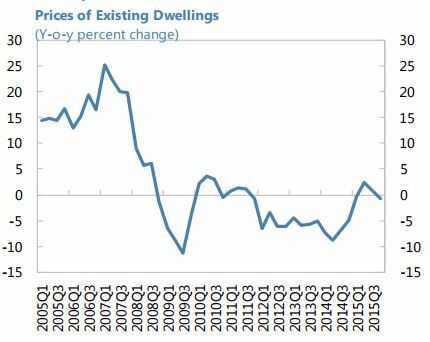 They find that beliefs in future house price movements are the most important driver of house prices booms and busts. 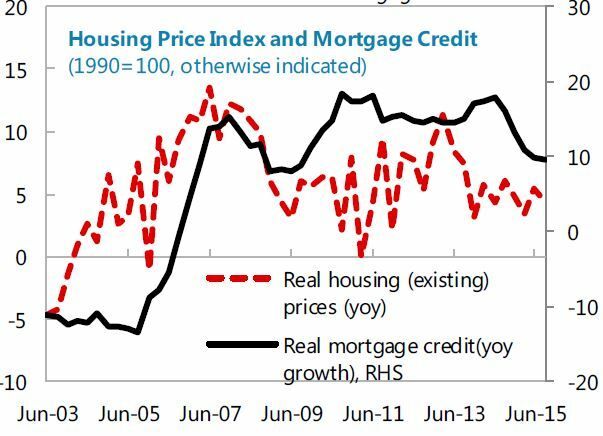 This is consistent with other recent papers which (a) stress the need to incorporate nonstandard house price expectations in quantitative models, and (b) admit that the credit channel is perhaps less important than we used to think. The discussant Ralph Luetticke (University of Bonn) suggested that the authors explore a bit more the differences in boom-bust amplitude between US states to say something more about the role of the different shocks. Ethan Ilzetsky (LSE) presented Interest Rates, Debt and Intertemporal Allocation: Evidence from Notched Mortgage Contracts in the UK, co-authored with Michael Best (Stanford), James Cloyne (Bank of England) and Henrik Kleven (LSE). This paper exploits a feature of the UK housing market whereby salient LTV thresholds (such as 90%) are associated with discrete jumps in the interest rate paid (which applies to the entire loan). The authors can estimate the elasticity of intertemporal substitution by looking at how many people decide to stop below the threshold as compared with a counterfactual “smooth” LTV distribution. The discussant Ben Etheridge (Essex University) asked for more information on the dynamics in the data, in particular on the remortgaging, and equity extraction patterns. Mariassunta Giannetti (Stockholm School of Economics) presented her work with Giovanni Favara (FED Board) Forced Asset Sales and the Concentration of Outstanding Debt: Evidence from the Mortgage Market, which addresses the question of why banks do not renegotiate more with their mortgage borrowers, since defaults are so costly. This paper shows that banks are more willing to renegotiate when they hold a higher fraction of total mortgages in a given area, i.e. when they can internalize the default externality. The discussant David Miles (Bank of England) focused on the different definitions of concentration in the mortgage market, and whether these are based on flows of new loans or the stock of outstanding mortgages. Jonathan Halket presented his joint work with Lars Neshiem and Florian Oswald (Sciences Po) The Housing Stock, Housing Prices, and User Costs: The Roles of Location, Structure and Unobserved Quality on why some properties are more likely to end up in the rental market or the owner-occupied market. Motivated by data from the English Housing Survey, where properties are less likely to be owner occupied if they are smaller and closer to the city centre, the authors construct a selection model with observable and unobservable housing features which they bring to London properties and interpret the results through a user-cost framework. Anthony De Fusco (Northwestern) kicked off the second day with his presentation Homeowner Borrowing and Housing Collateral: New Evidence from Expiring Price Controls in which he empirically disentangles the two mechanisms behind the observed relation between house prices and household indebtedness: wealth effect and collateral effect. He exploits a rule in Montgomery Country (Maryland) where people who bought houses at an affordable discounted price cannot resell their property at full market value before a certain date; up to that date, banks can only lend against the discounted price. The identification stems from the jump in collateral value at this pre-established date, and the absence of a corresponding jump in lifetime wealth. The discussant Orazio Attanasio (UCL) suggested that future iterations of this paper on this line of research should include a theoretical model of the mechanisms at work. “With credit growth moderate, real housing prices some 30 percent below their 2008 peak, and low financial depth, there is no evidence of imminent financial risks emerging”, says IMF’s report on Lithuania. “On the housing market and in light of ever rising housing prices, the authorities should explore the effectiveness of recent measures in containing risk and whether further macro-prudential measures such as limits to loan-to-value ratios in addition to those already taken in 2013 would be appropriate. 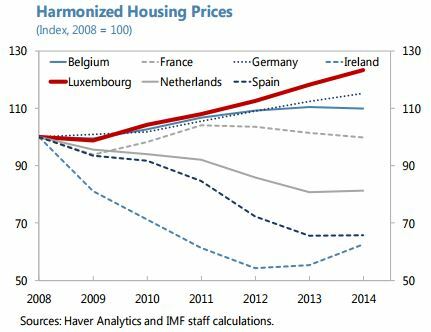 (…) While some of the tax measures aim to increase housing supply, the envisaged tax relief for home buyers would aggravate existing imbalances given that demand for real estate structurally outstrips supply”, says the IMF’s latest report on Luxembourg. 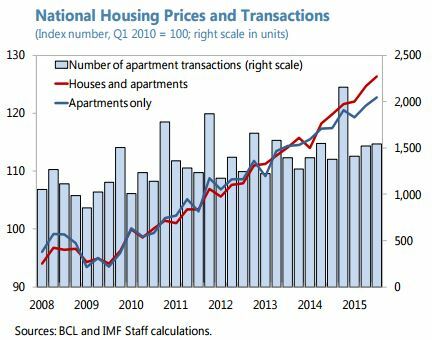 “…while house prices increased for the first time in about 3 years”, according to the IMF’s latest report on Slovenia.